Giuseppe Varano began to sing when he was 16. Appreciated internationally as a leading interpreter of Verdi and Puccini's operas, he is considered one of the most promising tenors of his generation. Giuseppe Varano completed his musical studies at the Conservatorio “A. Corelli” in Messina in 2002 and obtained further training at the Fondazione “Arturo Toscanini” in Parma (“Voci Verdiane”). He made his professional debut in July 2003 in La Traviata in Busseto, in a production directed by Franco Zeffirelli. He has also appeared at the Teatro Carlo Coccia in Novara in Madama Butterfly, in B. Galuppi’s Didone Abbandonata (with CD recording under Bongiovanni label) at the Teatro Caio Melisso in Spoleto, and in Lucia di Lammermoor, always in Spoleto. 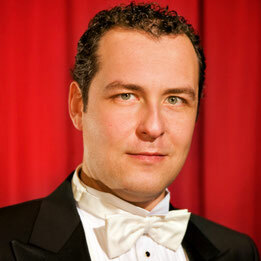 In 2007 the tenor returned to Spoleto for his La Bohème debut, and also appeared in Il Trovatore and Madama Butterfly. In 2008, he sang the tenor solo in G. Verdi’s Messa di Requiem in Messina. In 2009, we have to mention Giuseppe Varano’s successes as Alfredo (La Traviata) in Messina, in C. Gounod’s Faust in Palma de Mallorca (opera that he successively sang again at the Teatro Bellini in Catania), as well as his debut at the Teatro Comunale in Bologna as F.B. Pinkerton in Madama Butterfly and his Macduff in Verdi’s Macbeth in a tour in China with the Savonlinna Opera Festival. Giuseppe Varano was highly acclaimed on occasion of his debut at the Deutsche Oper am Rhein in the role of Rodolfo in Puccini’s La Bohème in October 2010; still in autumn 2009 Giuseppe Varano made also a highly successful debut at the Oper Leipzig in La Bohème and has been immediately reconfirmed for the next year in the same production. In summer 2010 he was very acclaimed on occasion of his debut at the Savonlinna Opera Festival in Madama Butterfly. During 2011-2012, he performed La Bohème in Düsseldorf, La Traviata at the Madison Opera in Wisconsin and in Graz (directed by Peter Konwitschny) and Verdi’s Requiem in Bucarest; Giuseppe Varano also made his debut as the Duke of Mantua in Rigoletto in Montreal, he performed La Traviata at the Pittsburgh Opera, Macbeth and La Bohème in Leipzig, A. Dvořák’s Stabat Mater at the Auditorium RAI in Turin – conducted by Juraj Valčuha, followed by a production of La Traviata performed in Modena, Piacenza and Bolzano. In May 2012 he made a successful debut at the Teatro “La Fenice” in Venice, as Rodolfo in La Bohème; while in September 2012, Giuseppe Varano performed Madama Butterfly at the Teatro Massimo in Palermo. During October and November 2012, he was once again Alfredo in La Traviata (Graz Opera House) and Rodolfo in La Bohème (Deutsche Oper am Rhein). In 2013, he debuts as Roméo in Gounod's Roméo et Juliette (Opera Colorado) and as Cassio in Verdi's Otello, directed by Giancarlo Del Monaco (Beijing Opera). His recent concert appearances include the tenor solo in Verdi’s Messa di Requiem in Messina and Bucarest and Dvořák’s Stabat Mater at the Auditorium RAI in Turin. His latest engagements include L'Amore dei Tre Re in April 2018 (Ney York City Opera) and Norma in September 2018 (International Opera Company Finland).